John Owen "Chief" Wilson (August 21, 1883 – February 22, 1954) was an American baseball outfielder who played nine seasons in Major League Baseball (MLB). He played for the Pittsburgh Pirates and the St. Louis Cardinals from 1908 to 1916. He batted left-handed but threw right-handed and served primarily as a right fielder. Wilson played triples in 1912 with 36, a record that still stands. Wilson was born on August 21, 1883, in Austin, Texas. He grew up at a ranch owned by his family located approximately 50 miles north of Austin in Bertram. He was known for his silent and introvert nature; his Pirates teammate and roommate Bobby Byrne recounted how Wilson "wouldn't say two words all day." Wilson started his baseball career playing in several teams in independent leagues, before joining the Austin Senators in 1905. After he retired from baseball, Wilson returned to his family ranch in Bertram, where he became a stock farmer and held various positions in service to the community. He died on October 24, 1954, at the age of 70 and was interred at Austin Memorial Park. On March 31, 2007, the Bertram Little League Sports Complex was dedicated to and named after Wilson in order to honor the city's famous inhabitant. Contrary to popular belief, Wilson was not of Native American descent. He was nicknamed "Chief" because his Pittsburgh teammates and manager Fred Clarke thought Wilson, a native Texan with a towering height of 6 feet 2 inches (1.88 m), resembled a "Chief of the Texas Rangers." In 1905, Wilson signed with the Austin Senators, a minor league baseball team in the Texas League. However, the team disbanded in the middle of the season on June 6 and Wilson joined the Fort Worth Panthers, playing for them until he was promoted the Des Moines Champs of the Western League in 1907. He performed well, posting a batting average of .323 in 56 games. It was during his first (and only) season with the Champs that Wilson was spotted by Denver Grizzlies' pitcher Babe Adams, who had signed with the Pittsburgh Pirates at the end of 1907. 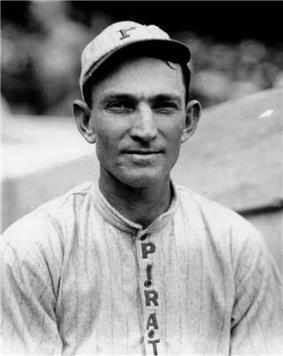 Adams informed Pirates owner Barney Dreyfuss of Wilson's "tremendous arm" and his ability "not only as a hitter but as a fielder." This prompted Dreyfuss to sign Wilson to the Pirates as their right fielder. Wilson made his major league debut for the Pirates on April 15, 1908, at the age of 24, in a 3–1 Opening Day win against the St. Louis Cardinals. A 1912 T207 baseball card depicting Wilson. During his 1908 rookie season, Wilson had a relatively disappointing year, batting .227, slugging .285 and finished sixth in the National League (NL) in strikeouts with 66. Out of his 120 hits that season, only 18 were extra base hits. As a result of his offensive woes, Pirates fans booed him on a constant basis. Wilson greatly improved his batting in the following season, raising his batting average to .272, playing all 154 games in the season and finishing fifth in the NL in triples with 12. This success culminated in the Pirates winning the World Series at the conclusion of that season. In the Opening Day game of the 1910 season, Wilson got injured and had to sit out for seven games, with Vin Campbell taking his place in the lineup. He finished the season with similar statistics as the previous year, batting .276 and hitting 13 triples. The 1911 season was a breakout year for Wilson. He posted a batting average of .300, finished third in the NL in doubles (34), fifth in home runs (12) and sixth in slugging (.472) and drove in 107 runs batted in (RBI), thus becoming the league's RBI champion. The 12 home runs he hit that season marked a Pirates team record he held until 1925. In 1912, Wilson recorded the same batting average as the year before and came second in the league in slugging (.513) and games played (152), third in home runs (11), fourth in RBI (95) and seventh in hits (175). Furthermore, he set the single-season record for triples, hitting 36 in total that year. However, his record received almost no press coverage whatsoever. Baseball sportswriter Ernest Lanigan suggested that this was because a record book erroneously attributed Nap Lajoie with having 44 triples in 1903, when he hit only 11 that year. As a result, several newspapers—most notably the Pittsburgh Press—were under the belief that Lajoie held the record. Wilson's record still stands today and is currently the third oldest single-season record, behind Lajoie's .426 batting average in 1901 and Jack Chesbro's 41 wins in 1904. It is considered one of baseball's most unbreakable records, as only Sam Crawford (1914) and Kiki Cuyler (1925) have come the closest to breaking the record; both players hit 26 triples. 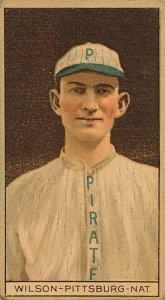 Wilson's record also accounted for part of the 129 triples amassed by the Pirates that year, setting a single-season for most triples by a team since 1900. Due to his stellar and record-breaking performance, Wilson finished eighth in that season's voting for the Chalmers Award, the precursor to the MLB Most Valuable Player Award. "36 Triples by Chief Wilson in a Single Season". Baseball-Almanac.com. Baseball Almanac. Retrieved October 28, 2012. ^ a b c d e f g h "Chief Wilson Statistics and History". Baseball-Reference.com. Sports Reference LLC. Retrieved October 22, 2012. ^ a b c d e f g h i j k l m n o p Armour, Mark. "Chief Wilson". The Baseball Biography Project. Society for American Baseball Research. Retrieved October 22, 2012. ^ a b c "Chief Wilson Minor League Statistics and History". Baseball-Reference.com. Sports Reference LLC. Retrieved October 22, 2012. ^ a b "Hail to the Chief". The Burnet Bulletin. March 28, 2007. p. 1A, 4A. Retrieved October 22, 2012. ^ a b Finoli, David; Rainer, Bill (April 1, 2003). Pittsburgh Pirates Encyclopedia. Sports Publishing LLC. p. 336. Retrieved October 22, 2012. ^ Holtzman, Jerome (December 18, 1996). Chief' A Pirate Who Tripled His Pleasure"'". The Chicago Tribune. Retrieved October 24, 2012. ^ "1908 Pittsburgh Pirates Schedule, Box Scores and Splits". Baseball-Reference.com. Sports Reference LLC. Retrieved October 22, 2012. ^ "1909 World Series (4-3): Pittsburgh Pirates (110-42) over Detroit Tigers (98-54)". Baseball-Reference.com. Sports Reference LLC. Retrieved October 23, 2012. ^ "Pirates Scheduled to Open Season Today". The Gazette Times (Pittsburgh). April 20, 1911. p. 9. Retrieved October 24, 2012. ^ O'Connor, W.J. (September 8, 1912). "Chief Wilson Poles His Thirty-Fourth Three-Bagger Of The Season". The Pittsburgh Press. p. 2 (Sporting section). Retrieved October 28, 2012. Only a phenomenal burst of long swats will give the Texan a chance to equal Lajoie's season mark of 44 three-base knocks...the wonderful record once made by Lajoie. ^ Egan, Timothy (October 2, 2004). "Baseball; Swift and Sharp, Suzuki Sets Mark For Hits in Season". The New York Times. Retrieved October 23, 2012. ^ "Single-Season Leaders & Records for Triples". Baseball-Reference. Sports Reference LLC. Retrieved October 24, 2012. ^ Gustines, Elena (April 29, 2009). "Mets Are Good at Something". The New York Times. Retrieved October 27, 2012. ^ "Baseball Awards Voting for 1912". Baseball-Reference.com. Sports Reference LLC. Retrieved October 27, 2012.